IT certainly would have taken you by surprise -- and you may have even looked twice -- but whoever said you can't ride through the drive-thru. Andrea Cheslin and Miffany Bolts did, on their horse. 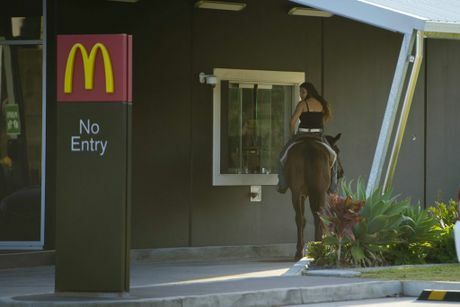 "We were just riding down Taragoola Rd and we thought we should go and get some Maccas," Andrea said. 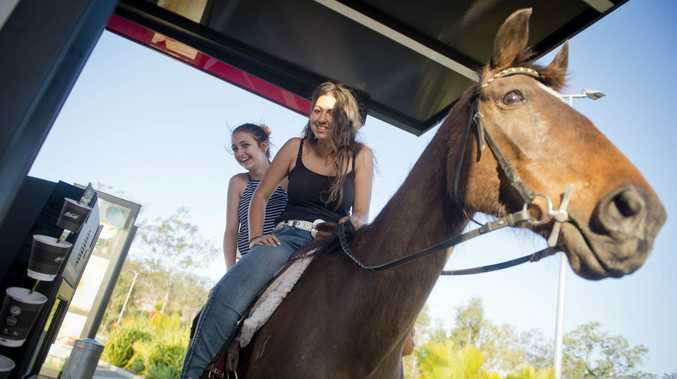 First things first, it was time to order; trotting up to the Calliope McDonalds speaker box the girls said they did get a few stares, but it didn't deter them from ordering a pack of nuggets and a couple of ice cold slushies. "We rode to the first window where we surprised the staff, they were taking photos and video as we paid. It was good fun." By the time the pair and the animals had made it to the last window, more than a dozen people had gathered around. "(Their horse) Chace kind of just rolls with it; he doesn't mind. Plus it was all good fun," she said.